Like Bears, Mosquitoes Fatten Up For Winter To conserve energy and beat the cold, female mosquitoes gain up to 10 times their warm-weather weight. Other insects, like the flightless midge in Antarctica, have found ways to adapt to severe dehydration and can even survive being frozen solid. Winter's a tough time if you're a mosquito. Icy temperatures can freeze your blood, dry air can desiccate you, and a mountain of snow can bury you. But mosquitoes, like bears, have found a way to make it through the winter: They hibernate. OK, before you hit the comment button, I know that technically speaking, mosquitoes don't hibernate ... although if you want to get really technical about it, some scientists say bears don't really hibernate either, they just go into a kind of deep winter sleep. But getting back to mosquitoes, what they do is go into a state called diapause. David Denlinger says it's a state where mosquitoes "essentially shut down their development and hunker it out until spring comes." Denlinger is an entomologist at the Ohio State University in Columbus. He studies a common backyard mosquito called Culex pipiens, and not all of them make it to spring. "The males die, and only the females overwinter," he says. And like bears, the females start storing fat as winter approaches. "They have a structure we call the fat body, which is much like the liver of mammals, and much of the fat ends up in that structure, although it's there in the blood and other tissues as well," says Denlinger. 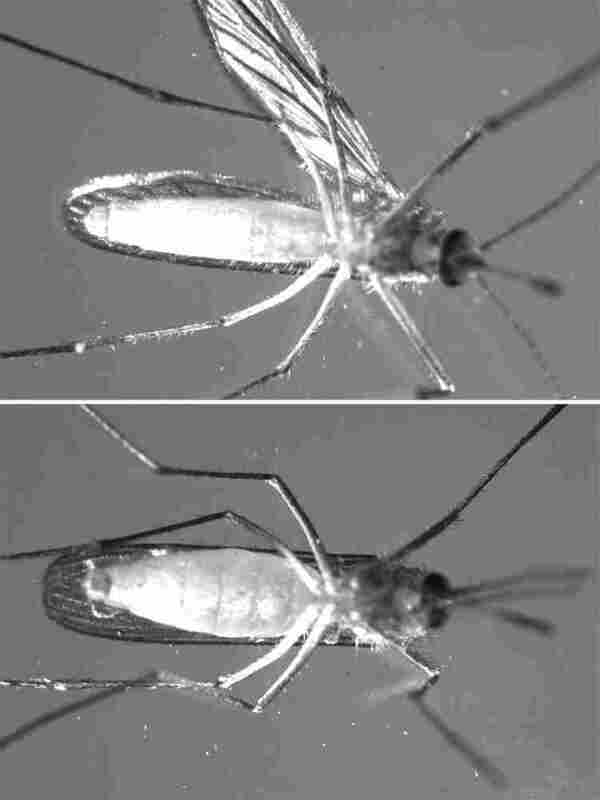 Females that go into diapause probably have 10 times the fat accumulation that a nondiapausing mosquito has. Culex pipiens isn't the only insect Denlinger studies. He's interested in how all cold-blooded insects make it through harsh winters. 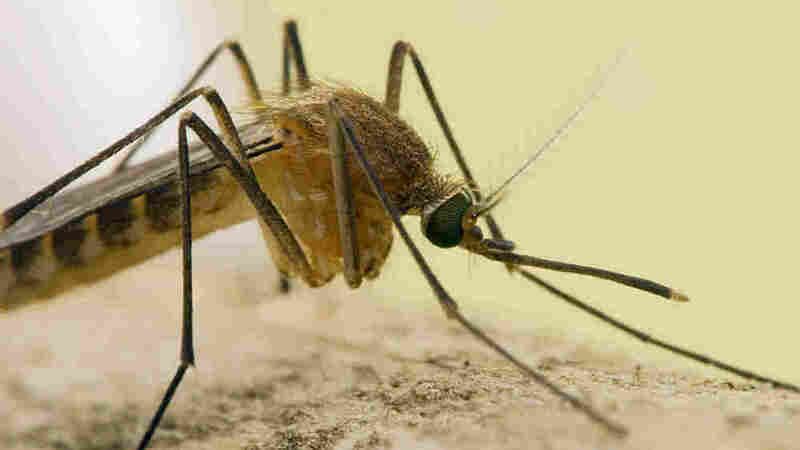 Female mosquitoes can gain up to 10 times their warm-weather weight as the cold rolls in. The males are not so lucky and do not survive the winter. "We were sitting around one day, and we thought we should really push this to the limit sometime," he says. So Denlinger and some colleagues mounted an expedition to Antarctica. The only insect that has survived through the ages is a wingless midge, Belgica antarctica. And it has some amazing survival strategies. "First, it retains its capacity to be frozen solid," says Rick Lee, a cryobiologist at Miami University in Oxford, Ohio. It does this by making sugars and sugar alcohols that protect cell membranes. It also produces heat shock proteins. These are special molecules that cells usually only make when they're under severe distress. The midges appear to make them all the time. And the midge has one more trick up its sleeve. "It can also tolerate severe dehydration," says Lee. In the larval stage, it can lose most of its body water. "These little larvae look like raisins when you dry them out like this. They look terrible. They look for sure that they would be dead. You put them in water, they plump up, and they wiggle away," Lee says. Of course, it's not much of a life, being a flightless midge in Antarctica. They spend two years in this raisin stage. Then in the summer, the adults emerge, mate and lay their eggs; they only live about 10 to 14 days. Seems like a lot of work for not much reward, but Lee says that for any species, there's really only one requirement for success. "Whether you can reproduce and leave offspring," says Lee. "That's the bottom line." An appropriate thought as we head toward spring.